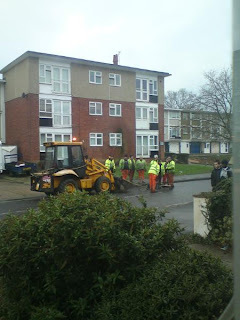 Because it takes EIGHT men to dig a hole. Apparently. They stood out there like that for an hour. Yes I am in a cranky mood today. Convict Tim here .. long time eh. funny .. this is obviously an international phenomena! Ah but only two are workers, the rest are management!